Two well turned-out Steampunks in the Vendor’s Room from last year’s Geneva Steam. I’ll be attending steampunk convention Geneva Steam Con the weekend of March 10-12. The convention is being held at the Lake Lawn Resort in Delavan, Wisconsin. I’ll be participating in two events at the convention, both on Saturday. At 3 PM I’ll be assisting with the Hot Glue Gun Bar, a make-and-take workshop for creating hair and hat ornaments. There is a $5 fee payable at the workshop in order to participate. At 4 PM, I’ll be moderating an author Q&A with authors Cassie Noble Beyer, Dan Jager, D. Lieber, Geoffrey Mandragora, and M. K. Wiseman. We’ll be talking steampunk, magic, mysticism, writing, and the publishing biz. Doubtless some of the discussion will focus on self-publishing, since several of these authors are self-published. There will also be a canned food drive in support of the Delavan food pantry operated by St. Andrew’s Catholic Church. Donations of non-perishable food items will be appreciated, and will be collected by food pantry staff at 5 PM on Saturday. All donations should be dropped off at the collection site before 4:00 PM Saturday in order to expedite pick-up. Please note: there is no provision for accepting cash donations: non-perishable food items only, please. 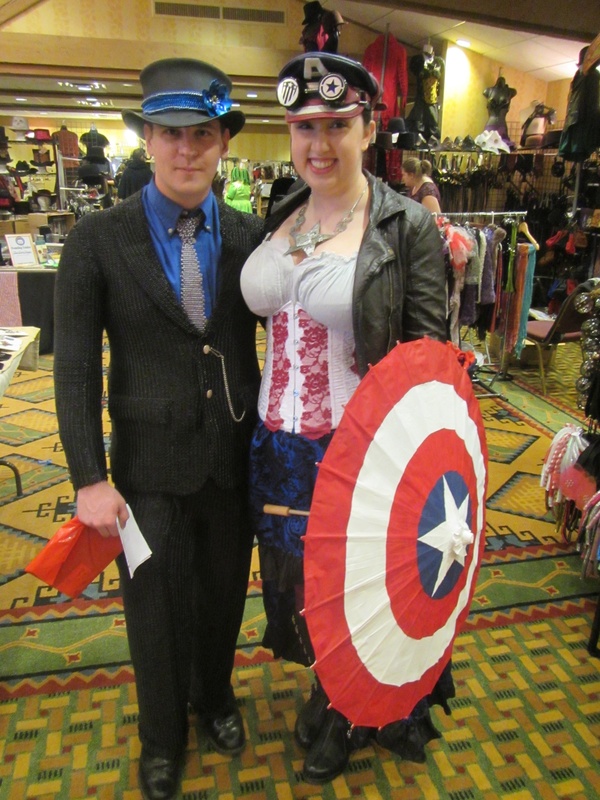 I hope anyone with an interest in steampunk will come out to buy a 1-day pass and take in the scene. Saturday is probably the best opportunity for a day trip, as many events are scheduled during the day and evening Saturday, and most of the best outfits and gadgets will be on display then too. There are excellent formal and informal dining options at the resort, and there are also a number of quality establishments in nearby Delavan. Hope to see you there — stop into one of my panels and say hello! Their website (from safari) gives no ticket costs on their home page. At the top navigation bar, look for “GSC Home”: a drop down menu gives you the option for “Tickets,” which takes you to a page that shows the prices for tickets, and includes at the door rates for the whole weekend and for day passes.